My maternal great-grandparents Albert Desgroseilliers and Clémentine Léveillé married 117 years ago today. Albert, a younger son of Pierre and Flavie (Lepage) Desgroseilliers, was born in February 1879. 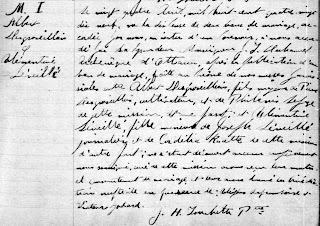 His bride Clémentine, a younger daughter of Joseph and Cordélia (Racette) Léveillé, was slightly older: she was born in November 1878. The young couple were distantly related: Albert was Clémentine’s fifth cousin three times removed. Albert, a farmer, and Clémentine married on 24 April 1899 in Limoges (known as South Indian, at this time) in Russell County, Ontario. Father Joseph-Hercule Touchette celebrated the nuptial mass. 1. St-Viateur (Limoges, Ontario), parish register, 1897-1910, p. 18 (stamped), entry no. 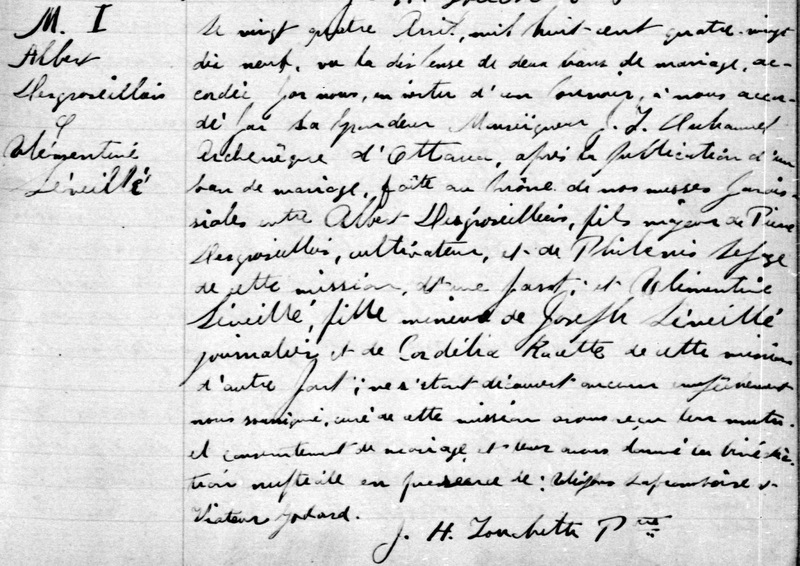 M.1 (1899), Albert Desgroseilliers – Clémentine Léveillé marriage, 24 April 1899; St-Viateur parish; digital images, “Registres du Fonds Drouin”, Généalogie Québec (http://www.genealogiequebec.com : accessed 4 July 2014).